Comment: I had a minor roof leak during the recent heavy rainstorm and my roofer evaluated things for me and feels sure it is related to holes/cracks in the chimney mortar. He suggested repointing or sealing. Itâs a low grade one story roof, easy to get to. Comment: I'd like a short (6-8") wall around my two front beds in order to hold in the topsoil. Comment: some parging is crumbling from the foundation block of the home. 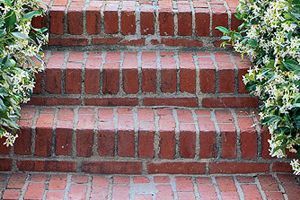 Comment: Bricks at bottom of steps are loose with cement between the disappearing. Need to repair and shore up any surrounding bricks... Looks like it due to water run off flow. Comment: small path has missing mortar with a loose tile needs to be secured. Durham Brick & Stone Masonry Contractors are rated 4.68 out of 5 based on 322 reviews of 16 pros. Not Looking for Brick & Stone Contractors in Durham, NC?